As in other centuries, life was tough to impossible in the Eighteenth Century if you were poor and was made worse with the successive Enclosure Acts which removed vast areas of common grazing. ‘Drunk for a penny, dead drunk for twopence’ was as common in this century as in the respectable Victorian times to come, and the misery of the poor is well illustrated by Hogarth, which makes a visit to the Sir John Soane Museum* in Lincoln’s Inn Fields well worth a visit. However, if you’ve stayed with me this far, that’s enough about misery. 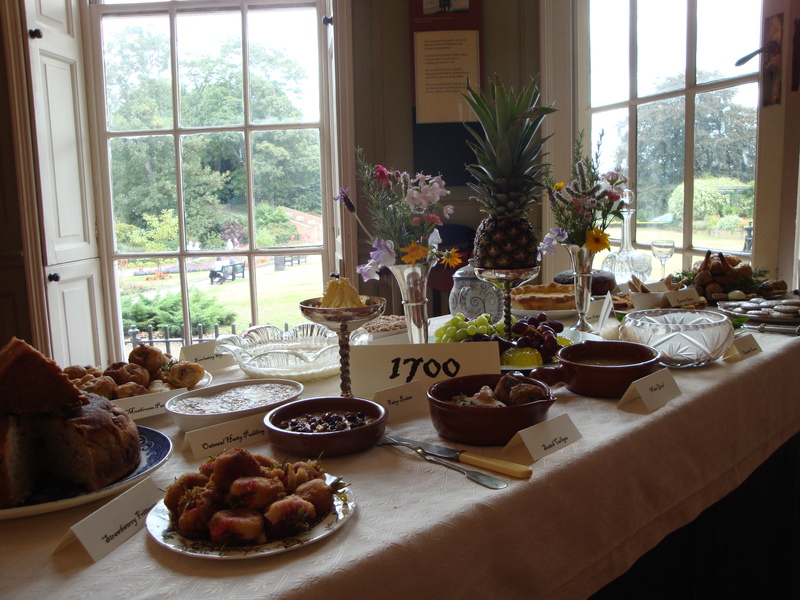 The Eighteenth Century is a fascinating and magical place for food inspiration as well. During the course of this century many influences and changes came into play where the diet of the better off was concerned which makes this a rewarding area to investigate. At the start of the century cooking was still mainly done over an open, and generally wood fire – so it was based on boiling and roasting. Ovens were separate and fired as they had been back in Tudor times or earlier. Up at Wollaton Hall* in the outskirts of Nottingham there is a perfectly preserved kitchen and range from Tudor times which includes a later Georgian oven and it is possible to see the developments in shape and size, but the firing principle is unchanged. Back to fires in general, however. Shortages of wood for burning led to more widespread use of coal, and this has to have better ventilation to burn successfully which meant the development of raised fire buckets and hearths. Fortunately all this coincided with developments in manipulating iron and steel, so it was a logical (and much safer) development to enclose the fire, use ventilating flues and add cooking surfaces which also became hot. The earliest enclosed ranges date fron the last quarter of the eighteenth century, as the next development was to enclose hot boxes at each side of the fire, perhaps putting an opening and tap in one to permit heating water. The range, and its descendent, the Aga, was born. Enclosed ovens meant greater possibilities with baking, demand was generated which encouraged the proliferation of cookware, and the great batteries de cuisine – largely Victorian – which adorn National Trust kitchens were born. Food was still strictly seasonal, so eggs would tail off during Winter months when root vegetables came to the fore and tender greens became a memory until the following Spring. However, there were huge advances in architecture, and the wealthy started to have orangeries built onto their homes. These light, heated, airy rooms allowed citrus fruit, previously always imported, to be selectively grown in the great houses. It was a logical development to use the principles of glass rooms, later greenhouses, to force other things too. An early glasshouse has just been fully restored at Hoveton Hall* near Wroxham in Norfolk. There were huge advances in horticulture: the range of plants and the period for which they were available was extended as storage clamps, heated beds, and the value of walled gardens were all experimented with by gardeners who paved the way for their Victorian successors. The old spices favoured by earlier generations – ambergris, long pepper, grains of paradise, zedoary and so on fell out of favour. Nutmeg, mace, peppercorns, ginger and cinnamon became far more easily available and proportionately cheaper as travel and trade (not to mention plantations and slavery) all developed. The sugar plantations meant that in relative terms the cost of sugar plummeted as well as being more widely available. It was still tedious to use as it came in sugar cones of varying sizes and the sugar had to be hacked off in chunks, nipped into small pieces and finally pounded in a pestle and mortar to reduce to a fineness usable in baking. Thank goodness, servants were still cheap enough for the wealthy to afford a kitchen full of staff! New tastes were formed, too. Breakfast ale fell out of favour except in the country where brewhouses were still attached to houses. Instead, coffee, tay (chai – indian tea has not yet appeared) and chocolate graced the breakfast board, in pots especially designed for them. Obviously this has been a very brief gallop through the changes of a century, but the last and most important to a cooking re enactor is the voice of women – and men too. Increased literacy amongst women had led to a surge in manuals, directories and volumes of ‘receipts’ or recipes. Not only would the young housewife expect to own and peruse these books, but ladies and their housekeepers also maintained commonplace books in which they stored either family recipes or those they had gathered from friends and families. As clocks also became more commonplace items in homes and staff quarters, expected cooking times were also sometimes mentioned. We can appreciate the rare vegetarianism of the Yorke family at Erddig in Wales because the housekeeper wrote down the recipes she collected and used for the family, but more importantly we can begin to hear the voices of the eighteenth century as recipes were meticulously copied, and the diners, like Parson Woodford, Jane Austen (and of course, Samuel Pepys in an earlier generation) not only wrote about what they had eaten, but what they thought of it. We can see the interest people took in their food by the way it was recorded, in the dishes, cookware and equipment that developed to prepare it, and in many cases we can replicate it easily and simply. Ingredients expensive in the Eighteenth century are commonplace storecupboard items for us now, and if we don’t have them the nearest supermarket will usually stock them. The endless pounding, sieving and straining of the original recipes is achieved in moments with standard kitchen gadgets and the grill replaces the need to heat and stand with a salamander over dishes that need browning to finish them off. In other words, we have no excuse for not rattling off an occasional Georgian masterpiece to impress our friends or just for a change. * Sir John Soane Museum in Lincolns Inn Fields is one of the hidden gems of London. Once it was a well kept secret, accessed only by ringing the front door bell, paying pence to prove oneself not a vagrant, and signing the visitor’s book. Now it is at last better known, but extremely eclectic, with a sarcophagus in the basement, Hogarth originals upstairs, and all sorts of unexpected items in between. Wollaton Hall on the outskirts of Nottingham sits in over 600 acres of parkland. Conceived as a prodigy house, its postion on the top of the hill, and the extensive use of glass in the upper storeys means that when it is misty it seems to float. Combined with early morning and evening light this effect can be magical. There are deer in the park, and the basement has a relatively recently restored but original Tudor range, complete with smoking hearth and Tudor drains under the floor. The connection of the kitchen chimney with those in the rooms above means that when I was cooking there, all the upper rooms were in no doubt as to the menu which could be embarrassing if anything got burnt. Hoveton Hall, just north of Norwich and a mile or so outside Wroxham is not open to the public. It has been in the same family since it was built at the start of the nineteenth century, and the grounds, which are open regularly, are well worth visiting. There are areas of early 20th century planting, a picturesque lake, and superb walled herbaceous and kitchen gardens. It celebrated its 200th anniversary this year and the restoration of its original glasshouse.